GameStop says that DLC programs like Online Pass, which are designed to discourage pre-owned game sales, will actually have a positive impact on its business in the long run. Online Pass, a new initiative from EA Sports that requires purchasers of used games to pay extra to gain access to features like online play, would by all appearances look like bad news for GameStop, which enjoys healthy profit margins on used game sales that new games just can't match. But that's not the case, according to CEO Dan DeMatteo, who said in a conference call with investors that the company actually sees downloadable content as a positive factor for "extending the life of titles and broadening the base of players." 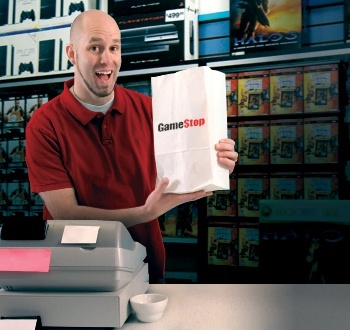 Instead of approaching DLC as a threat, DeMatteo said GameStop was working to help publishers sell the content to gamers, a tactic which benefits everyone. The sale of DLC helps game companies "better leverage their [IP]... through downloadable content sales to both used players and new game buyers," he explained, and can give GameStop a boost at the register too: He said the company sold "notably more Xbox Live point cards" when it promoted the Modern Warfare 2 Stimulus Package DLC in its stores. "GameStop consumers are ahead of the mass market in digital adoption. Our investments in proprietary point-of-sale tech have put us in a position to partner with publishers as they grow their digital offerings," he said. "We're having convos with multiple publishers on leveraging the potential of digital sales at GameStop stores." In no small part, I'm sure, because "multiple publishers" are joining EA on the DLC bandwagon: Both Ubisoft and THQ recently announced that they plan to launch their own Online Pass-style programs in the near future.